The latest data shows that while the proportion of young people applying for a university place is at an all-time high – with 37.4 per cent making applications to Ucas – there is a stark regional difference: nearly fifty per cent of 18-year-olds applied in London, compared to just over 30 per cent in the North East. Clare Marchant, the new chief executive of Ucas, lays the blame for the regional gap in university applications squarely at the door of schools. Although this is a crass and overly-simplified blanket statement, which fails to appreciate the more nuanced and subtle dynamics at play when it comes to aspiration, she has got a point. Schools have a responsibility to stoke aspirations, to encourage young people to think big and to think about what’s possible – not what’s impossible. Too often, we hear of teachers who refuse to encourage their brightest students to consider Oxbridge, because of their own preconceptions about who these institutions are for. We hear of boys and girls being pigeonholed into subject-specific paths, which close off whole industries, just because of their gender. Too often, we hear of teachers who say, “you can’t” instead of “you can”. Thankfully, these individuals are outnumbered by the armies of teachers who believe their job is more than just securing a set of exam results. At Astrea, this is core to everything we do – our mantra is to provide an education that “inspires beyond measure”. But it’s not enough to have fine words with no action. We are putting our money where our mouth is and investing in something called the Astrea Promise. This is our commitment to an inspirational educational that reaches far beyond the confines of the classroom. Ensuring that our pupils achieve academically to the very best of their abilities is non-negotiable. But that is only the beginning. During their time with us, every Astrea pupil will have the opportunity to experience 30 different memorable activities and challenges that have been specifically designed to develop character, nurture talents and fire up ambition. Working through bronze, silver and gold activities, pupils will have the opportunity to get involved in a whole range of exciting projects, from growing and eating their own food and climbing a mountain, through to visiting both London and one foreign country. Critically, the Astrea Promise also includes a visit to a university. 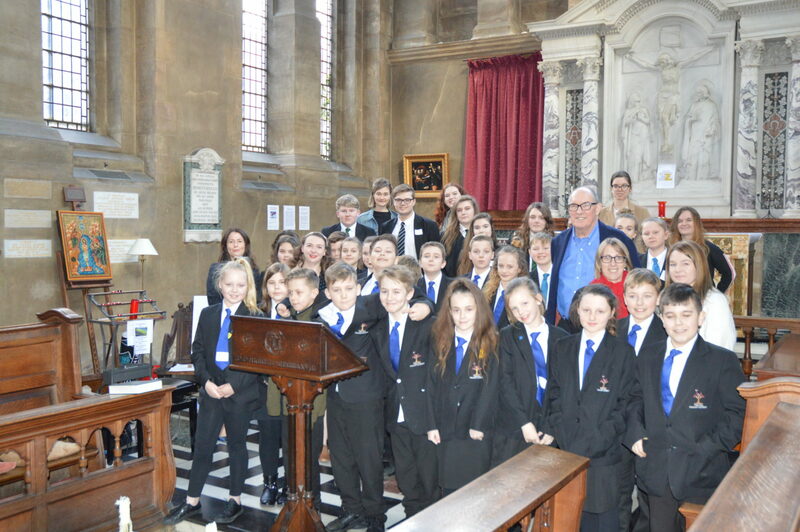 Last week, a group of Year 6 pupils from the Hill Primary Academy in Rotherham and Year 7s from Netherwood Academy in Barnsley visited Hertford College, Oxford University. 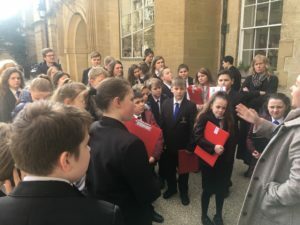 .As part of their visit, the children were taken on a tour of the college and attended a session with its librarian, who talked to them about the wonder of books and the knowledge they contain. 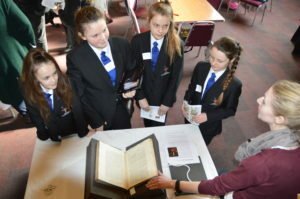 The group was treated to a close up look at five books dating back to the 1600s. 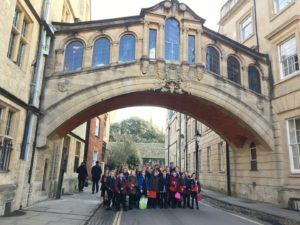 They took part in a career speed networking event, where small groups talked with undergraduates from Oxford, including a former pupil from Netherwood about life at Oxford. 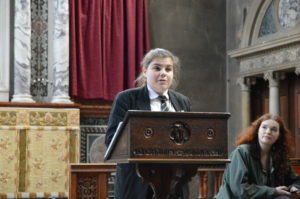 The day concluded with them taking part in a debate in the college chapel, where they honed their speaking skills in a debate on the pros and cons of social networking. This type of outreach work is happening in lots of primary and secondary schools across the country, but it is not yet happening systematically. What we are doing is knitting this type of opportunity into the fabric of every-day school life, so that it becomes absolutely the norm for every school in our trust. At Astrea, we are passionate about inspiring beyond measure so that we can close the aspiration gap. Aspirations should be no different, whether you are from Barnsley or Barnet. We all have a role to play in helping systematically eliminate that gap so every pupil can fly. That effort would be more powerful if as trusts and institutions we joined forces, shared what works and opportunities. This kind of collaborative working could lead to a generational shift in aspirations, particularly in areas that have previously lagged behind. To effect systematic change, we need the system to work together.